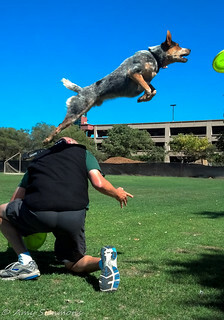 Vader's Disc Dog World: Where Can You Walk Your Dog in the BAY AREA? 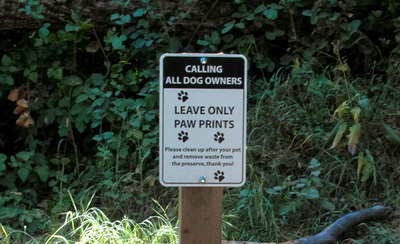 One of the toughest things to find about the Bay Area region is whether a dog owner can take his or her pup anywhere, legally, these days. As in, a walk in the park or even going off-leash for some fun. 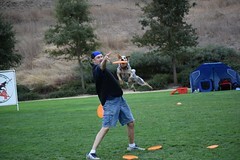 As it stands, Vader and the team (of humans) have to play Outlaw Disc Dog (www.outlaw-disc-dog.com) (This is just a domain that points back to Vader's World here.) if we want to practice our disc routines. Of late, we've had an incredibly high number of encounters with Menlo Park police and the highly feared roaming Animal Control officer. 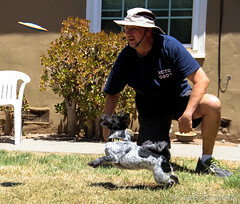 There should be allowances for professional or well-trained dogs. Just sayin'. So we've been looking to take our practices and exercise routines anywhere but Menlo Park. 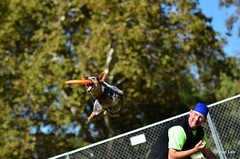 And we don't do dog parks because there's no room to practice our professional routines or run after discs safely in. But if you meander around the region by car, you'll note how often you come across parks that don't want dogs. But then I found a great couple of resources that helped us find new locations for walking Vader. And the options seem wonderful! 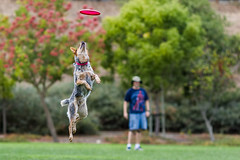 Garin Park is a favorite for us. It cost $5 per car to get in, and $2 per dog. But they have a great facility if you want to have a picnic and wonderful hiking with miles and miles of trails, with wonderful views. We need to be on a leash for the first few hundred feet, but once we get through one of the gates, Vader can be leash free, and it's huge! Plus, you'll find yourself possibly walking right by free ranging cows. There's lots to do and if you take the long way around, it's a few hours of walking! 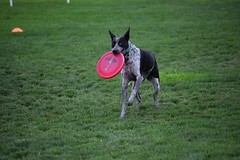 BRING PLENTY of WATER for all in your party, dog and humans! This is a 366 acre park with 6 miles of trails, and in the center of it is a completely free off-leash area! 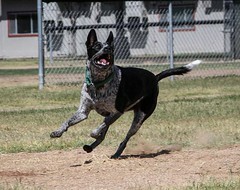 Then we found the Open Space web site that focuses on parks that have trails for dogs! 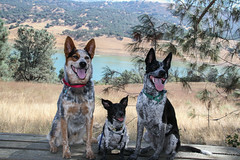 We saw one website that seems to indicate that "Almaden Quicksilver County Park" allows dogs. In the East Bay zone, you can hit up their interactive map and choose "Dog Walk" and hit search, and that will show you what parks allow dogs. Of course, the dog walking is more liberal on that side of the bay, so you have a ton of options. This is a very smart map where you can zoom in or around and such. Speaking of maps, check this out: wikimapia.org . It's a map site with overlays and if something you're curious about is on the map click on it and see the info that comes up, with links to that location, if available. So for the Bay Area region, there are enough options to keep dog owners happy! Now all we ask is that some of you actually pack your dog's crap out. If you keep tossing your crap (no pun intended) over a railing and into the stream, your laziness WILL RUIN it for the rest of us. Don't do that! 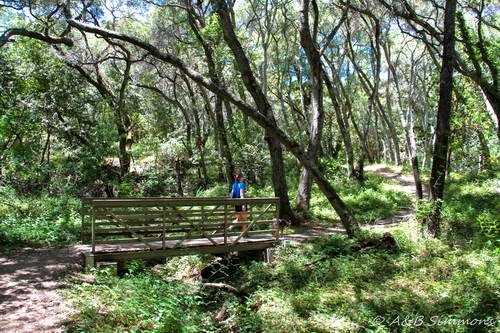 If you like to hike, there are no better places than the East Bay Regional Parks. Dogs on leash through the initial gate, possibly on leash past cows with calves (moms get aggressive), but otherwise the dogs run free. 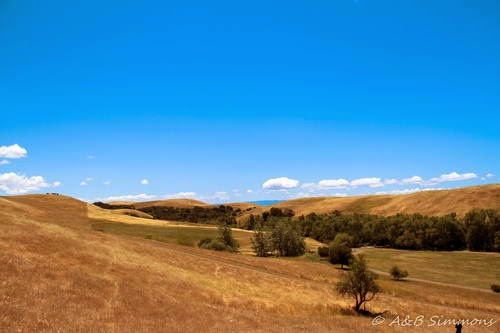 Our favorites are all the trails in the Sunol-Ohlone Wilderness, Las Trampas, Morgan Territory. Worth the drive.